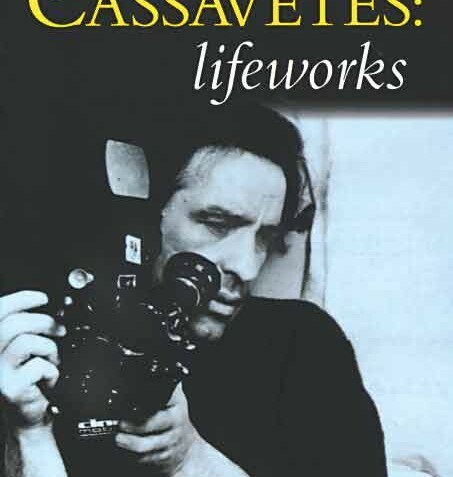 "There ought to be more books about John Cassavettes", posits author Tom Charity at the outset of his own contribution to Cassavettian literature, John Cassavettes: Lifeworks. It’s a rather odd way to start off a "critical biography" (Charity’s words), complaining about the lack of fellow studies on a subject, but the statement does make you wonder: Why aren’t there more books on him? Seminal auteurs such as Ford, Hitchcock and Welles have over a dozen honorary tomes to their names — hell, even Quentin Tarantino’s bound tributes number in the double digits. Except for a handful of works, however, there’s been precious little written about the patron saint of American independent filmmaking. For many people, the mere mention of the word Cassavettes is shorthand for an entire ethos of bucking the system in search of something beyond the superficial pleasures of Hollywood. An actor who was fed up with the Tinseltown claptrap he was being offered, he longed to see "real stories about real people" on screen. Long before the terms "indie"or "Sundance" became de rigueur, the director and his repertory company of amateurs decided to just go out and make their own personal visions manifest. Though his films sometimes drew the ire of critics and the indifference of mainstream audiences, Cassavettes’ contributions to cinema were as revolutionary and staggering as Stravinsky’s, Ornette Coleman’s and Thomas Pynchon’s were to their respective mediums. Yet the filmmaker was adamant that his work alone speak both for itself and for it’s creator and he insisted that his friends, family and collaborators honor his request after his demise. The prospect of penning a readable biography on the man seemed a daunting exercise indeed. Other than noted film scholar/author Ray Carney’s exhaustive work in the early ’90s (he also recently edited Faber’s Cassavettes on Cassavettes interview compendium), virtually no one attempted to tackle his work or life outside of its peripheral influence on today’s cinematic landscape. Luckily, Charity pored through old interviews and articles written on the filmmaker and managed to convince many of the main players involved in John’s life and work, as well as commissioning several high-profile fans (Gary Oldman, Jim Jarmusch, Pedro Aldomovar, John Sayles) to contribute their thoughts on the late director. Lifeworks includes both original testimonials and culled anecdotes from the people who sweat and toiled alongside Cassavetes in the trenches. And, in honor of the filmmaker’s request, Charity devotes a great deal of space to critical analysis on all of his films. The resulting book is one part biography, one part theoretical trouble-shooting, and all parts a labor of love tribute. Charity’s coverage of Cassavettes’ life is thorough, tackling historical details and relating the ups and downs of the director’s personal life to his professional output. Son of Greek immigrant parents, student of the American Academy of Dramatic Arts, the temperamental actor who took part in sub-par films and TV shows to finance his own pet projects, a devoted husband and father who placed his work above everything else, the tireless champion of "human stories" who favored exploration over flashy film technique — all of Cassavettes’ personas get a turn in the biographical spotlight. Yet, importantly, Charity never forgets that much of the story lies in the films themselves. His deconstructive takes on Cassavettes’ work are both educated and enlightening, emphasizing recurring motifs and filmmaking tics in a scholarly manner yet never delving into academic double-speak. Even the subjective, less polished prose passages seem appropriate to the material; considering how raw and roughly passionate the auteur’s work is in its attempt to capture pure emotionalism, the author’s passion for the material overriding poetics seems strangely apt for his subject. What Lifeworks occasionally lacks in comprehensive obsessiveness (see Carney’s books, it more than makes up for in enthusiasm. Charity is first and foremost a fan, a fellow filmgoer who was transformed by Cassavettes’ unpolished look at the human psyche in all its fragile, bruised and unflappable glory. The author neither paints a saintly, whitewashed picture nor does he revel in sordid details of the man’s imperfections. Rather, by placing much of the focus on the films, and his own love of the late filmmaker’s work, Charity’s love letter pays tribute to the man behind the lens and overcomes any jagged literary edges the book may possess. It’s a great introduction to the work of a man who literally changed the way we watch movies. In a perfect world, his name would be invoked with the same reverence as the other denizens of the directorial pantheon: Yes, Mr. Charity, there should be more books on the John Cassavettes. With any luck, they will all be written with as much passion and love as this one.